The Zapper doesn’t work on modern televisions because the technology Nintendo used to create it relied on the dependable timing of old-school cathode ray tube televisions. Instead of actually shooting anything, the Zapper is a light sensor. 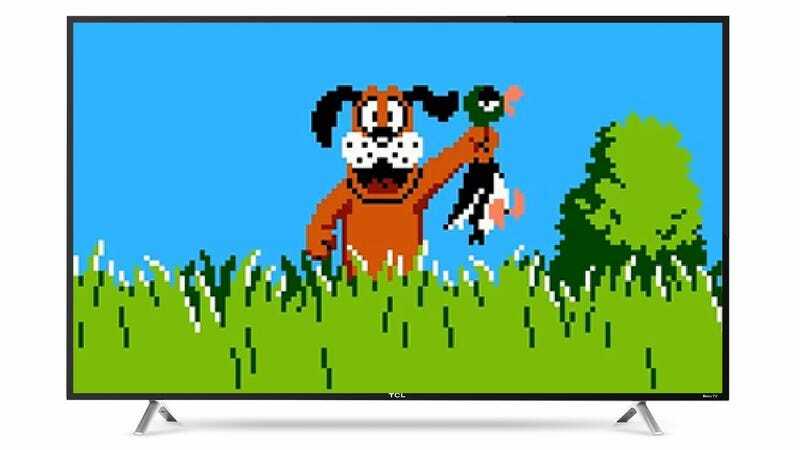 When the trigger is pulled while playing Duck Hunt, Hogan’s Alley, or any of the handful of Zapper-compatible games, the television screen goes black for a single frame. Then, any viable targets on the screen appear as white boxes for another frame, before the game goes back to rendering as normal. If the Zapper detects the white boxes within the center of its sensor array, it registers a hit. Modern televisions don’t have a consistent draw rate, so the Zapper won’t sync up with the screen properly. This renders Nintendo’s classic peripheral useless. The Hyper Blaster HD, being demonstrated this week at CES in Las Vegas, uses a special HD adapter to sync its sensor with the television it is attached to, making the old black-and-white screen trick work once more. One caveat—the Hyper Blaster HD requires an original NES console to function. Third-party retro consoles, even those made by Hyperkin, will not work. There’s no pricing or release date yet for the Hyper Blaster HD, but that’s fine. We’ve been waiting this long to play Duck Hunt on our flat screens, so what’s a few more months?